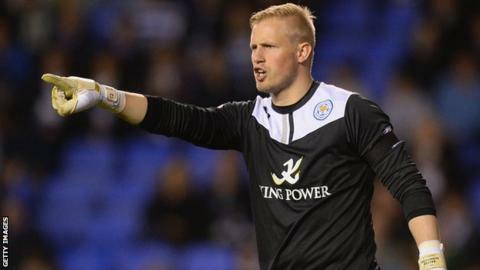 Goalkeeper Kasper Schmeichel says he has had preliminary talks about a new contract with promoted Leicester City. The 27-year-old Denmark international reaches the end of his deal with the Foxes in the summer. When asked about his contract situation by BBC Radio Leicester, he said: "It's up to the club at the moment. We've had some preliminary conversations. "Of course I want to stay. We've got to the Premier League and I'm happy here, but it's not up to me." Schmeichel, whose father Peter lifted 15 trophies in eight years with Manchester United, played a key role as Nigel Pearson's side won the Championship title by nine points. The former Manchester City, Notts County and Leeds United man, who has been at Leicester since 2011, was an ever-present in their league campaign, conceding 43 goals in their 46 matches. But he is one of several out-of-contract players, a group that includes leading scorer David Nugent, yet to agree fresh terms at the King Power Stadium.